Since 1999 I have been using a 1996 vintage DEC PII desktop as the router/firewall between the internet and my home network. The DEC computer came to me with Win95 (or possibly Win98) in 1998, got SuSE linux and started its mission as router and firewall (and CUPS server, and IMAP server, and various other server stuff). When upgrading the SuSE installation to a newer version went south, it spent a while running ThomasEz’s floppyfw, until I used a floppy net install to install debian potato, immediately switched it to debian testing, until debian woody arrived, when it was moved to debian stable, and then I just kept running “apt-get dist-upgrade” until I finally had it running debian 8 “jessie” on june 6 in 2015. The old DEC desktop has survived its maker company, survived lightning strikes that have sent the power supplies and/or main boards of other computers on the same LAN into continously beeping mode (i.e. broken). However, in December 2015 it started acting up, and crashing with irregular intervals (sometimes two weeks, sometimes one day). So… the time for a replacement would have to be not too far ahead. The question was what to replace it with? ThomasEz immediately suggested using a raspberry pi with two NICs, but I thought that would be too puny, and I investigated alternatives like Shuttle Barebone DS57U but I found that the raspberry pi alternative was so cheap, I might as well order one. And then it turned out to be so simple to set up so I had it up and running before I really had decided on anything, so now the r-pi is what I have. 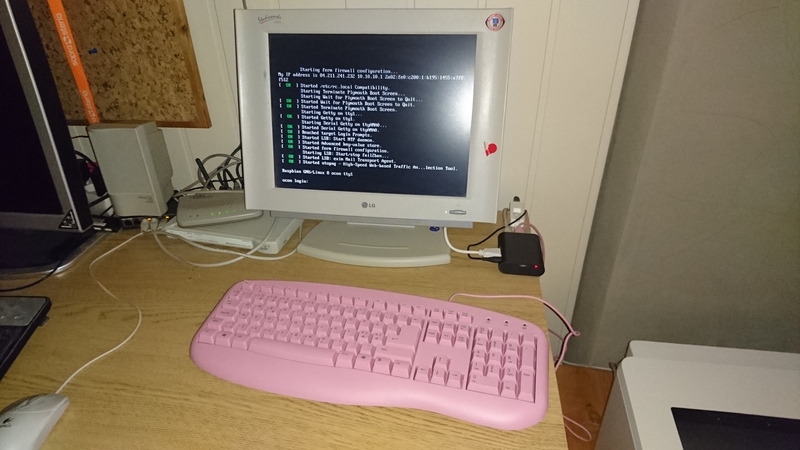 The original plan was to run the raspberry pi headless, but since I had an old VGA only LCD display for the old DEC computer I might as well hook it up the raspberry pi, together with the cheap USB keyboard used for setup. I rebooted the raspberry pi, and this time the LCD displayed showed the boot messages as well as a normal console login prompt. And this is where the current state is. One initial concern was flash wear on the SD card, which doesn’t have the wear leveling features of a “real” SSD, so I had some plans on making the /var/log use tmpfs.